Home / About Us / Our Providers / James A. Bell, M.D., Ph.D.
James A. Bell, M.D., Ph.D. is a board-certified orthopedic surgeon specializing in orthopedic trauma, sports medicine and joint replacement. He is also certified in Sports Medicine. He joined Desert Orthopedic Center in 1996. A native of New York, Dr. Bell knew at a young age that he wanted to be a doctor. With anatomy as his favorite school subject, it was only natural for him to pursue medicine. Dr. Bell received his Bachelor of Arts in biology from the University of Rochester, NY, and his Master’s and Ph.D. in physiology from Pennsylvania State University. He earned his Medical Degree and served his orthopedic surgery residency at the University of Southern California. Following graduation at USC, Dr. Bell spent four years in the U.S. Army as an orthopedic surgeon serving at U.S. hospitals and traveling around the world. Prior to joining DOC, he was Chief of the Department of Orthopedics and Lieutenant Colonel for the 67th Combat Support Hospital in Wuerzberg, Germany. 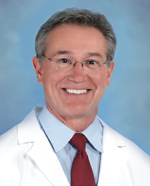 He is a fellow of the American Academy of Orthopedic Surgeons and a member of the American Medical Association, California Medical Association and the Riverside County Medical Association. Dr. Bell serves as the team physician for Palm Springs High School football games and is also a team physician with the United States Figure Skating Association.